On a sunny Fall Saturday afternoon, the Johnson Hagood Stadium may very be one of the most popular and exciting spots in the city of Charleston. Home to the Citadel Bulldogs, the official football team of the world-renowned Citadel, the stadium can squeeze in 21,000 football fans to cheer on their favorite cadets and players, enjoy the action, and celebrate one of Charleston's favorite local sports teams. The stadium is located adjacent to The Citadel, in the southwest corner of Charleston, and just a few miles if not blocks away from the primary downtown attractions. The stadium itself is named after Brigadier General and later Governor Johnson Hagood, who was a Citadel alumni in 1847, led local Confederate forces in Charleston during the Civil War, and years later, initiated the successful re-opening of The Citadel as a military academy well after the war was over. The stadium replaced the former College Park Stadium, a Hampton Park structure that was deemed utterly deteriorated and unsafe. 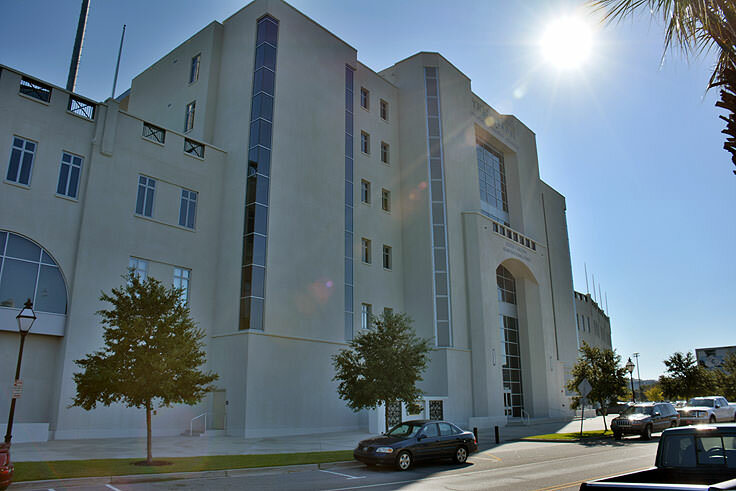 Instead of repairing the existing stadium, the city of Charleston opted to build an entirely new structure that could accommodate thousands of fans. In 1946, the architectural firm of Halsey & Cummings broke ground on a brand new $600,000 stadium that could seat up to 22,343 fans. The stadium was officially open on October 16th, 1948, with a home game against Davidson College, and a formal dedication of the new digs commenced just a few weeks later during a Citadel / Clemson game - one of the school's most famous local rivalries. Despite the number of consecutive seasons that the Bulldogs would play on the field, the stadium didn't belong to the Citadel itself until 1963, when the college officially bought the structure and the site from the city of Charleston. More than 40 years later, the stadium underwent an extensive renovation to bring it up to "modern times," with an improved media center and luxury skyboxes. The 2005 remodel brought the Johnson Hagood Stadium into the new century, and although the price tag for such a venture was steep - an estimated $42 million - the reviews of the "new" facilities were overwhelmingly positive. The Bulldogs football team itself is always exciting and entertaining to watch. Since arriving at the new stadium, the Bulldogs have gone undefeated in five seasons, (1959, 1978, 1980, 1981 and 1988), and won 16 consecutive games at home from 1980 - 1982. In addition, the stadium has hosted two NCAA Division I-AA National Championship games. 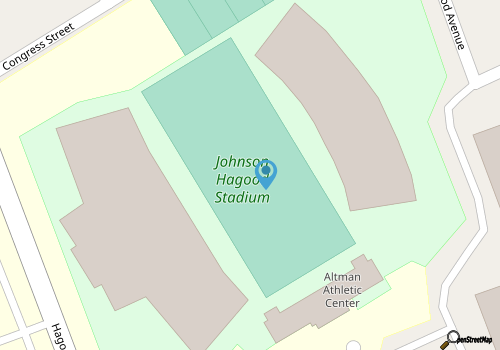 In the 1990s, the stadium was also the site of an archeological dig, after it was determined that the Johnson Hagood Stadium was located on top of a mariners' graveyard. When construction began in 1948, the graves were moved, but unfortunately, not the remains themselves due to a miscommunication, and as a result of 1993 and 1996 dig, nearly 20 sailors were recovered under the stands and the parking lot, and were successfully moved and reinterred at the famous Magnolia Cemetery. This grisly side note in history aside, the Johnson Hagood Stadium has generally always been known for good competition and a high-spirited atmosphere, and Citadel students and the public are both welcome to join the crowds that trickle into the stadium almost every fall weekend. Tickets for the Citadel football games can be purchased online at http://www.citadelsports.com/tickets/tickets-new, or at the McAlister Field House Ticket Window at The Citadel, which is open during normal business hours Monday through Friday. Schedules for the upcoming football season are available online as well, at http://www.citadelsports.com/sports/fball/2013-14/schedule, so visitors can plan to watch their favorite teams in action while staying in South Carolina. Concessions are readily available at the stadium, as well as souvenirs, restrooms, and plenty of parking. Football game attendees are urged to purchase tickets as far in advance as possible, as despite the stadium's ability to host some 20,000 fans, seats fill up quickly on big rivalry weekends. The Johnson Hagood Stadium and the Citadel Bulldogs have clearly left their mark on the collegiate sports scene since the stadium first opened for football games in 1948. A popular destination for Charleston locals and visitors alike on any given Saturday, this site with a world of only recently uncovered history is sure to wow anyone who decides to take in an afternoon or evening game. Folks who are planning a fall South Carolina retreat, and who love nothing better than a great game of football, should reserve an afternoon to scope out this modern stadium with a unique past, and get into the team spirit that is simply abundant in Charleston, SC. The Charleston City Marina is often deemed the "Mega Marina," as it is easily one of the largest marinas in the southeastern United States. Conveniently located at mile marker 469.5 along the Intracoastal Waterway (ICW), and just a stone's throw away from the historic downtown, the marina is one of the most visited spots and temporary homes for mariners from all across the country. Accommodating for both travelers by land and by sea, with a host of amenities and incredible views of the harbor and the Ashley River, the expansively grand marina is sure to make any visitor yearn for an evening or afternoon on the water, and an adventure on the high seas.